Geling Jiang is an award-winning multi-instrumentalist who started her professional training at the age of 10. After graduating from Wuhan Music Conservatory, she became a member of the Chime Bell Ensemble of Hubei Province. As a 20 year member of the ensemble , she recorded numerous radio broadcasts, TV programs, and films; and toured in the United States, Japan and Singapore. 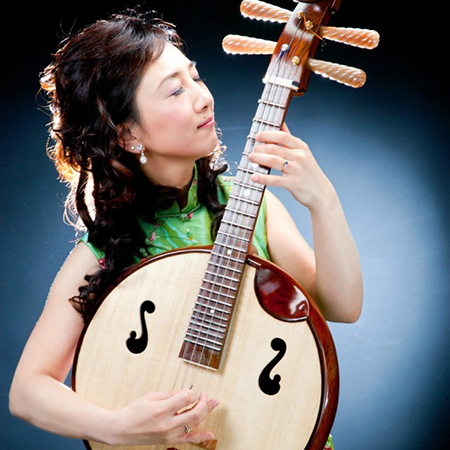 Trained initially as a sanxian (three-string fretless lute) player, she also regularly plays the zheng, liuqin, ruan, and Jing-erhu. From 2004, after immigrating to Canada, she joined several contemporary music ensembles based in Vancouver and performed across Canada, the US, the Netherlands, Malaysia, Philippine and China: she was a zheng player in Orchid Ensemble; now sanxian, ruan and zheng player in Red Chamber; ruan, sanxian and zheng player of Cloud Bell Ensemble. She has been a guest musician working with the Vancouver Symphony, the University of British Columbia (UBC) Symphony, the Elektra Women’s Choir, and a Chinese music instrument coach at the University of British Colombia School of Music. She is not only an excellent musical interpreter for composers, but also a good improviser with different musicians. Ms. Jiang played with the UBC Symphony in March of 2013. At the UBC Roy Barnett Recital Hall she played a sanxian concerto with Nu:BC which was composed by John Oliver. In October of that year, she played a liuqin concerto with BC Chinese Orchestra in Vancouver and a Jing-erhu concerto in Bellingham, Washington in 2012 and at Benaroya Hall, Seattle, Washington in 2013. She also recorded with CBC radio in 2013. Ms. Jiang recorded a zheng piece for composer, Stephen Chatman’s CD. She is hailed as a virtuoso instrumentalist by numerous Canadian composers. Ms. Jiang is known to be a flexible performer and adept at all kinds of new music and free improvisation on different instruments. She has played pieces by Canadian composers: Dorothy Chang, Owen Underhill, Moshe Denburg, Mark Armanini, and Hope Lee. Being an essential player in numerous ensembles, she has recorded several CDs such as Red Chamber Album I and Album II, album of The B.C Chinese Music Ensemble:Bamboo Shoot in Spring. Ms. Jiang is currently a regular member of Vancouver Inter-Cultural Orchestra, BC Chinese Orchestra and BC Chinese Music Ensemble. In the past few years she has absorbed other cultural music and developed non-traditional instrumental techniques on her own instruments. On the Red Chamber’s second album, she made her compositional debut, co-writing with Randy Raine Reusch. After immigrating to Canada, she remains musically active and has begun a new life in the Vancouver music scene. She joined BCCMA (BC Chinese Music Orchestra) in 2004. In this organization, she has preformed many concerts and musical activities, such as recordings for CBC (2013) . She is now the Plucked String Section Tutor of the BC Chinese Youth Orchestra. In August, 2014, Ms. Jiang was invited by Hubei Provincial Musuem to perform a solo concert. She now works with several Canadian composers on projects for zheng and sanxian with string quartet.